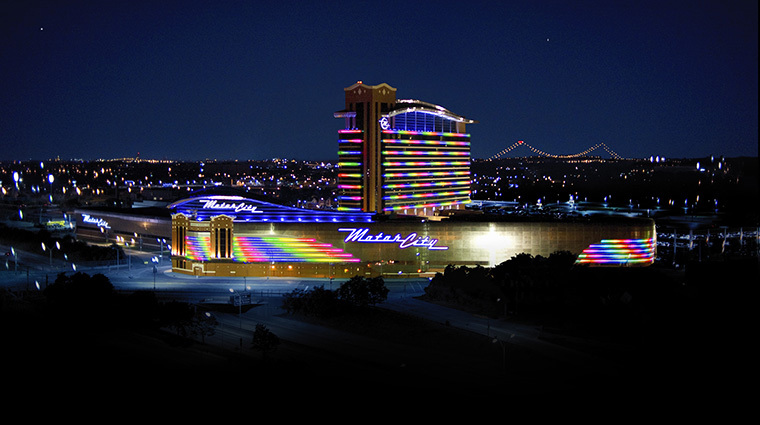 Situated on the 16th floor of MotorCity Casino Hotel, Iridescence is on any self-respecting foodie’s Detroit bucket list. As soon as you step into the dining room, your attention will be pulled in competing directions by the panoramic view of the Detroit skyline making up the restaurant’s south wall; by the 150 floating light spheres suspended from the 30-foot-high ceiling; and by the floor-to-ceiling automated wine rack featuring a selection that has earned the modern-American restaurant a reputation as a place to go for serious vino. 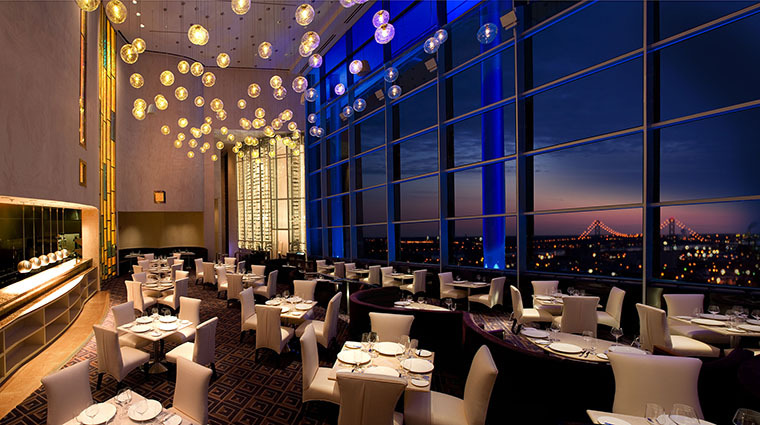 High-top tables line the wall of glass offering primo views of downtown Detroit and the Windsor, Canada, skylines, as well as Ford Field and Comerica Park. Cozy booths facing the same skyline views offer an intimate seating alternative. Live piano music is a fixture on Friday and Saturday nights, and the aromas of chef de cuisine Nicholas Geftos’ culinary concoctions will have you grabbing for the restaurant’s iPad menu. Iridescence is known as much for its intelligent 7,000-plus bottle wine collection as for its haute fare. The elegance of the Detroit restaurant is matched by its service. You likely won’t wait for refills on the water, which is replenished regularly with Fiji bottled water. Knowledgeable servers will offer wine pairing recommendations and share their own personal favorites. A unique experience can be had with the restaurant’s American kaiseki menu, a seven-course tasting experience. You won’t be privy to any of the courses coming your way — it’s all purely chef’s choice. Adventurous guests who enjoyed the American kaiseki will have a chance to meet with the chef himself — Geftos will visit with diners table-side to share his inspiration for their meal. The Detroit restaurant serves dinner only five days each week, from Wednesday through Sunday. Iridescence is closed on Monday and Tuesday. 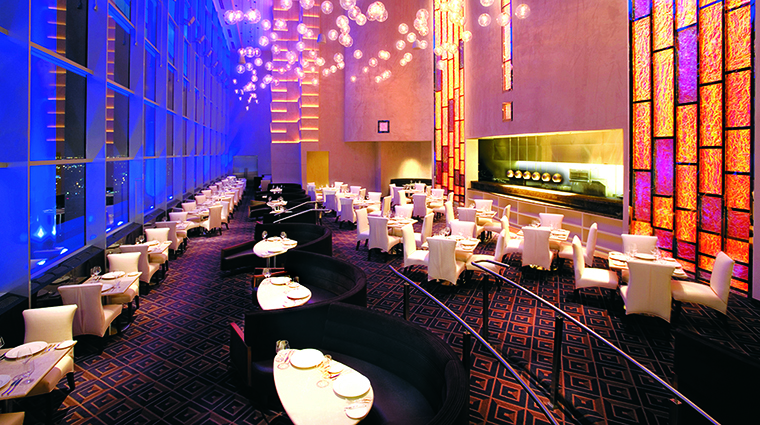 Breathtaking views, phenomenal wines and inspired cuisine add up to a memorable meal at Iridescence. That being said, you’ll want to look the part—ladies should plan to don a cocktail dress and gents will feel comfortable in khakis or slacks and a button down. Reservations are highly recommended at this stylish Detroit restaurant. Call ahead to book. Iridescence is known for its Himalayan rock salt dry-aged beef and its cioppino seafood dish featuring scallops, nishiki risotto, shrimp, watercress, Prince Edward Island mussels and Treviso. Get things started with appetizer favorites like the hoisin and cab-braised beef short rib garnished with vanilla-ginger sweet potatoes, walnuts, edamame, brûléed bay scallops and amaranth. An equally popular starter is the sautéed jumbo lump crab cake surrounded by corn, leek, asparagus, ragout, arugula-herb salad, lemon vinaigrette and beet syrup. Cap your meal with a sweet — options include a strawberry mousse with angel food cake and strawberry cheesecake ice cream, and the peanut butter mousse and milk chocolate ganache bar served with roasted peanuts and caramel. Via computer, servers can call up a bottle by year, region or varietal where it will have been rotating in a temperature-controlled room kept at an ideal 54 degrees. Opt for a signature cocktail like the Passionfruit, served spicy or sweet depending on your palate — it features a blend of habanero-infused rum, Merlet Trois Citrus Triple Sec and passion fruit purée. Or try the Purple Rain Drop, with blueberry vodka, Amalfi Coast limoncello, lemon juice, lemonade and blueberries.